In a below post from Nov. 9th, 2009 on this blog, I had covered the earliest British Disney books, concentrating on publications by Dean & Sons Ltd. 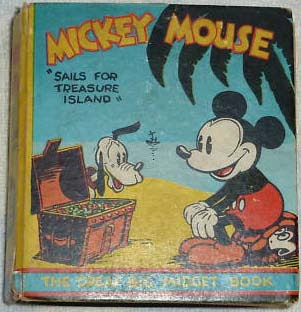 Recently, I've become aware of another early Disney book by Dean which I had not mentioned in that post: Mickey Mouse Sails For Treasure Island. This is the British edition of the US book by Whitman with the same title from 1933. The US edition was part of a popular series called 'The Big Little Books' while the British edition carried the tag 'Big Midget Book'. The British edition featured a different cover illustration, which curiously included a white Pluto, than the US one. It is undated, but probably either from 1933, the date of the US edition, or mid-1930s. The copy whose image is above was recently sold on ebay for 100 British pounds (=app 157 US dlrs). Another copy had been earlier sold by Hake's for 185 US dlrs. As I had noted in my earlier post, Dean had also published a book simply titled as Mickey Mouse with the tagline 'Great Big Midget Book', which might have been the British edition of one of the Big Little Books. There are two Big Midget Books titled just "Mickey Mouse". One of them, showing Mickey walking and waving on the cover, is the British edition of the first American MM Big Little Book (which was also called just "Mickey Mouse," and which included the Gottfredson gypsy story from 1931).